This morning, it's a bit cold but sunny. I woke up at 8 and found my way downstairs. I had setup my Rancilio Silvia to start up at 7 so it would be nice and warm. Sadly enough, the timer device I used is broken.. So after half an hour I made some very nice espresso to finally wake up. I missed my regular train, so I took the next one which forces me to change trains twice. The train was broken.. it kept on activating the emergency breaks. Finally I got to the station in Diemen (close to Amsterdam). 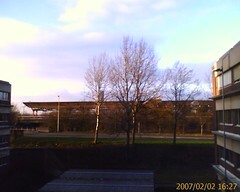 This station is directly under one of the major flight paths to Schiphol airport. I got out and the sun was shining on my face.. I took a deep breath and smelled the kerosene. I made me think of Pisa aeroporto and some visions of beautiful Italy passed by. I walked to the office, which is directly next to the train station. There isn't much green in Diemen, except for the small park like area on the other side of the office. I passed by some bushes and trees between the station and the highway exit and heard the birds singing. The sun was warming up my face and I was listening to the sweet tones of a nice piece of music by Fabrizio de Andrè. Live can be so beautiful...Then I entered the office building. Warm, dry air hit my face. I tripped over a piece of loose carpet.. dust everywhere. Why are we working inside these offices again? Is christmas too early or the snow too late?